Common skin lesions include moles, freckles, benign lentigines, seborrheic keratoses and skin tags. These lesions are usually benign and therefore are not considered as health threats. Moles are defined as small congenital pigmented growths on the human skin, which are usually dark, slightly raised and dark and sometimes hairy. Moles can be seen in any area of the skin and will appear in different sizes, shapes and colors. They are usually benign but there are some types that can be dangerous. Brown is the most common color for moles and is caused by melanocytes which are skin cells containing the pigment melanin. Melanin is produced by cells called melanocytes and provides limited protection again skin damage from sun exposure; melanocytes increase their production of melanin in response to sun exposure. Dark-skinned people have more melanin than light- skinned people. Freckles are small, concentrated areas of increased melanin production. Sun exposure increases the number of moles on the body and may also cause them to become darker in appearance; changes in the body such as pregnancy may also alter the appearance of moles. Moles are more common in the first 20 years of a person’s life, and will usually change over a period of time, with some completely disappearing. There are two types of moles: Congenital nevi are moles that appear at birth and are considered more of a cancer risk factor than moles which appear after birth. The second mole type is Dysplastic nevi which are larger than average and irregular in shape. Dysplastic nevi moles are also risk factors for malignant melanoma which is the most dangerous form of skin cancer. A mole’s color, size and shape factors used to determine if it’s benign or cancerous. Other factors include sensitivity to touch and bleeding. Cherry angiomas, medically known as Campbell de Morgan spots are noncancerous (benign) skin growths. The color of a cherry angioma may be bright, blood red or deep, dark purple and it is approximately 1/4″ in diameter and is usually flat. The small clusters of skin capillaries surrounding the mole are what create the red papule, also known as a “dome”. Because of the similarities in appearance it is easy to confuse red moles with cherry angiomas. The colors of all moles are derived from the melanin that is present. Although the more common colors are black and brown, there are other possible colors such as pink and red. As such there are occasions where red moles will appear without any distinct cause; however, other factors may influence their color. A brown mole may become red as a result of excess exposure to sun light or ultraviolet rays. This is especially true if the area suffers sunburn. Irritatants such as clothing may also cause a mole to turn red. 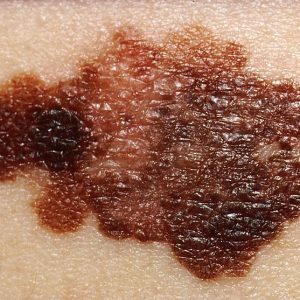 A mole that has changed in color must be examined for cancer agents.